Depending on your project type and requirement if there are good open source solutions are available we may advice to go for it. It helps to reduce total costs of your project. The best part is most of the open source have flexibility to customize it as per ones requirement giving it personalize feel. 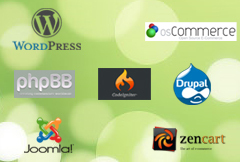 We have worked on many open source technologies which includes, CMS ( Content Management System ), e-Ccommerce, shopping carts, blogs, community services and variety of open source modules.